If your washer is giving you trouble, try these quick fixes to see if you can get things back on track. 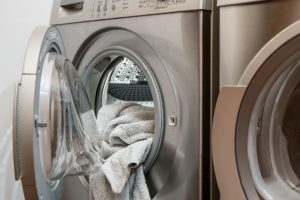 The washing machine may be one of the most overused and underappreciated appliances in the house. We don’t think much about them until they stop working the way we want them to. And as anyone who has found themselves parting with their hard earned money eight dollars in quarters at a time in a laundromat knows, that can be a frustrating experience. If your washer is giving you trouble, try these quick fixes to see if you can get things back on track. If it won’t turn on and the wash cycle won’t start, the first thing you should do is check that it’s plugged in. No, that’s not a joke. Washing machines (especially as they get older) tend to rock, sometimes even walking themselves forward or backward. All this motion can easily work the plug out of the socket. Next, check the breaker box to see if the circuit breaker was tripped. If it was, you need to keep an eye on the machine as it runs through its cycle to make sure it doesn’t trip the breaker again (and if it does, you should call an electrician). Finally, check the water supply leading to the machine for leaks or clogs. If it is clogged, then you may have a plumbing issue, and the cycle may not be starting because it doesn’t have enough water. If you can’t find the clog, a professional plumber may be able to help you figure out the issue. If the machine starts okay, but the drum doesn’t spin, check the belt. The belt is a piece of rubber, usually, at the base of the drum, that makes it turn. Usually, you will only need a screwdriver to remove the panel and check the belt. If it has slipped out of place or broken, that’s likely the culprit for your issue. Adjust it or replace it, and you should be good to go. Before you do this, you should check your manual to be sure you won’t be voiding the warranty by opening the panel, if the machine is still under warranty. When the cycle finishes, is there still water sitting in the bottom of the wash tub? This is an indication that there is a clog in the drain somewhere. Use towels and buckets to get the water out of the tub so you can check it for clogs. Most washers drain into a stationary tub, so check that drain line for a clog as well. If you still have questions regarding your home remodel and what that means for your plumbing situation, Mahon Plumbing is here to help you out. We have been serving the Baltimore area and beyond since 1994. We have the experience in our trained professionals to compliment our spectacular service. Feel free to give us a call at our Baltimore location at 410-766-8566 or our Pasadena location at 410-636-7944. For tips, tricks, and to see what we have been working on, please do not hesitate to follow us on Facebook or Twitter. This entry was posted on Thursday, April 4th, 2019 at 4:05 pm. Both comments and pings are currently closed.